Crew Quarters B is a really nice, neutral way of referring to the dump that is the Derelict Quarters. The blue room. Not the blues room. Would you believe that there's a whole room on this station dedicated to the color blue? No, it's not the Bridge; less than half of it is blue, though it's a really nice blue. No, it's not the AI Upload or Stock Market Room either, but those have nice blues too. And it's not the Jazz Lounge either; that's the blues room. 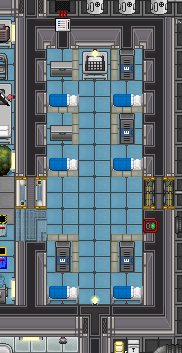 It's Crew Quarters B, the dormitory on the east side of the Crew Quarters. This tall one is absolutely loaded with blue. Blue tiles, blue bedsheets, blue-banded lockers, blue knit caps--honestly, it's kinda uncomfortable. It's probably for the better that that walls aren't blue either, because it'd probably look super unnatural. This room does not have vent, although the room left to it does. Thank god that's not blue, or the Port Air Hookup feeding into it would have to be blue too. On Samedi, Crew Quarters B is an otherwise unremarkable generic-suite crew quarters room that, for reasons unknown, has its own APC. If you ever feel like finding out why, visit the maintenance tunnel above the Kitchen. It'll be the one on the far left.